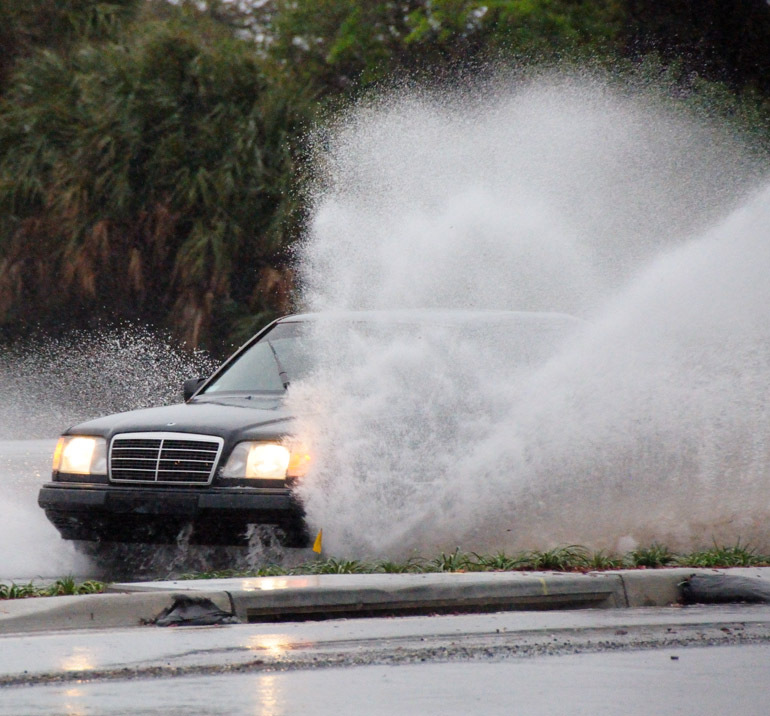 A black Mercedes-Benz splashes through a pool of rainwater that collected in the passing lane of southbound U.S. 1 across the street from Wuesthoff Medical Center-Rockledge. The heavy rain was the worst part of this storm. It's still, supposedly, the dry season here in Central Florida. 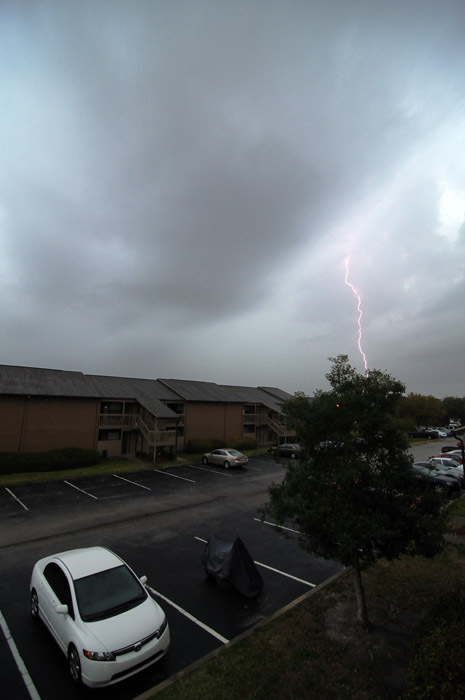 Before I left my apartment, the storm started with some lightning. This one wasn't close, but it was the only strike of the day that I caught. Oh, and that's my covered-up motorcycle in the foreground. Along with warm weather, as referenced a couple of days ago, comes bad weather in Florida. And the people who like to shoot bad weather in Florida. Today's atmospheric happenings were brought about courtesy of this wintertime's storm-generating machine: El Nino, Spanish for "the boy" (or to be more specific, the Christ child). A few times this season, energy and moisture have collected off the Gulf of Mexico and created large eastward-barreling squall lines over much of Central Florida. That was the case Sunday. Only once this year has such a storm system spawned tornadoes in Brevard County, and that was when I was fast asleep one January morning as the twister damaged nearly 300 homes just to the north of my apartment. Two areas of today's event, though, carried the potential for tornadoes. 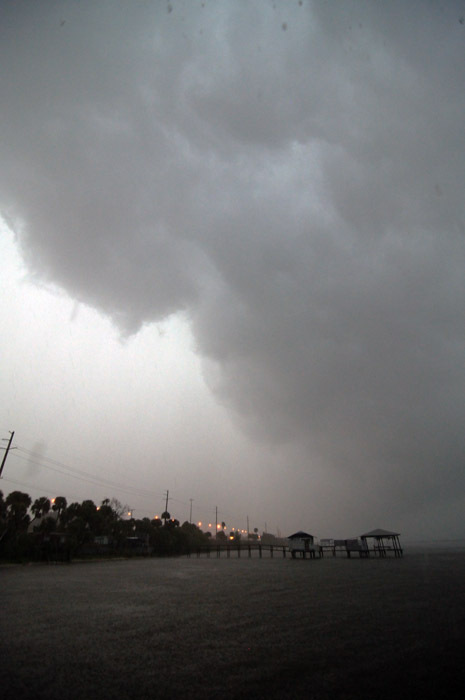 Television meteorologists said the mesocyclones were rotating and picking up strength as they neared the Space Coast on their northeasterly course. More interested in lightning, I set out to an area near where the strongest part of the storm was supposed to rip through. When I stopped at a small park by the Indian River in Palm Shores, though, lightning struck a utility pole about 15 feet away, making me rethink getting out of the car. I then realized that I'm a wuss and that I'm only 5 feet, 10 inches tall - give or take ... OK, OK, I'm more like 5-9 - considerably shorter than the multistory light pole. Lightning likes tall things; therefore, lightning hates me. Or so goes my logic. Through the downpour, I bolted to a covered picnic area at the end of a pier jutting into the river. A perfect spot to be hit by lightning or a tornado, I thought. I snapped pictures of the dark clouds. The lightning was gone, for some reason. But the wind was coming from the east and the west and the north and the south, indicating that there were extraordinary forces at work - none of which made love to my camera, though they did get it quite wet. Rain comes down hard outside my covered spot on the Indian River. All this happened around 5:30 p.m., but the clouds made it quite dark. 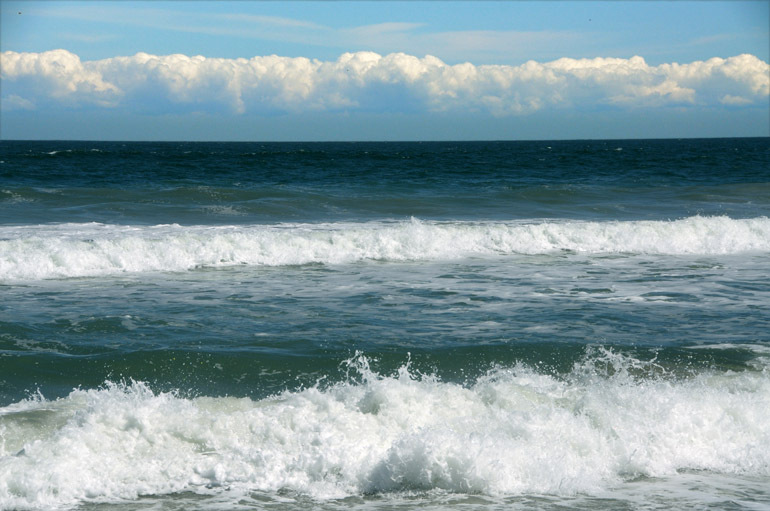 But alas, no tornado, no waterspout. The storm passed over the river without destruction. The pelicans nearby were the most disturbed by the event, as they flew from one spot of the river to another each time the wind picked up in the area they were occupying. A few ibis seemed inconvenienced, too, as they huddled under the boardwalk leading to the pier. I drove farther north to Rockledge, where there was still hope for activity, according to the Emergency Alert System message on the radio informing motorists that, as a better alternative to weathering the tornado in a vehicle, they should "find the nearest ditch" and lie face down. I was having no part of a water-filled ditch in which I would surely drown if I were to plant my face into it. 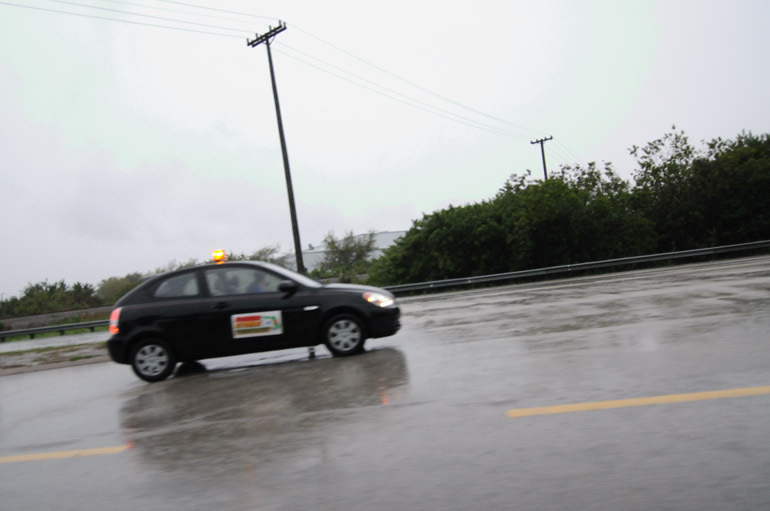 Along northbound U.S. 1, I passed a small black coupe with a light on top that flashed yellow. A sign on the side said, "Florida extreme stormchasers." I'm not sure which was meant to be extreme: the storm or the chasers. Or both. But there was only one chaser in the car, so I briefly felt the urge to correct the errant plurality of the logo. I snapped a blurry shot of the storm chaser's car as I passed. He was sizing up dark, low-hanging clouds in the distance. The clouds don't look dark in this shot, though, because it's overexposed. On that topic, I don't consider myself a storm chaser. I'm a photographer with a propensity to shoot whatever naturally occurring event or rocket-propelled object is the most exciting thing happening at the time. My car requires neither a flashing light nor a flashy logo to warn motorists of my tendency to rubberneck and gawk at clouds while I travel at speeds often in excess of 70 mph. In the end - instead of a magnificent daytime lightning photo, or a hit YouTube video of a tornado ripping up the platform I was standing on, or a shot of a waterspout forming a rope ladder to heaven - all I got was wet. Soaked, actually. I went home to cook myself a warm chicken dinner - in which, ironically enough, the object was to keep the meat sufficiently moist. 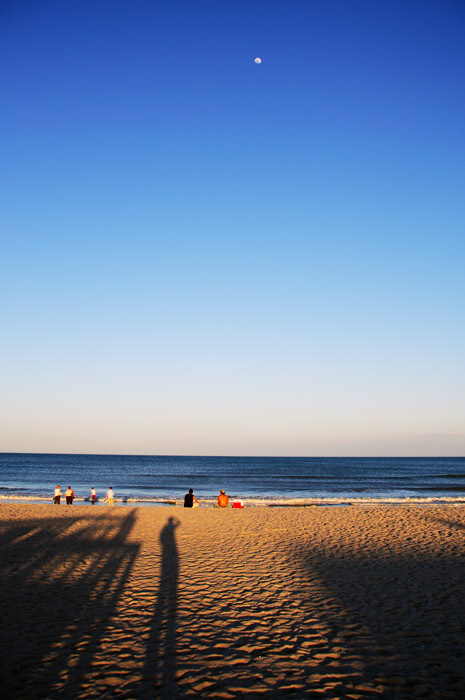 The scene on Cocoa Beach during a stop with my motorcycle around sunset Friday night, the mildest evening so far this year. Finally, spring has sprung in Florida. After week upon week of horrendous cold - highs no higher than 70 degrees on many days, preventing the snowbirds from spreading their wings and the spring break tourists from, well, doing whatever they do - the mercury hit 80 degrees Friday. It's perfect motorcycling weather, though with the warmer temperatures, the insects are back in force. But there's nothing like a large dragonfly hitting you in the nasal bridge at 70 mph to usher in the season. It's only a matter of time before the weather starts becoming more active, which indubitably means more storm photographs. 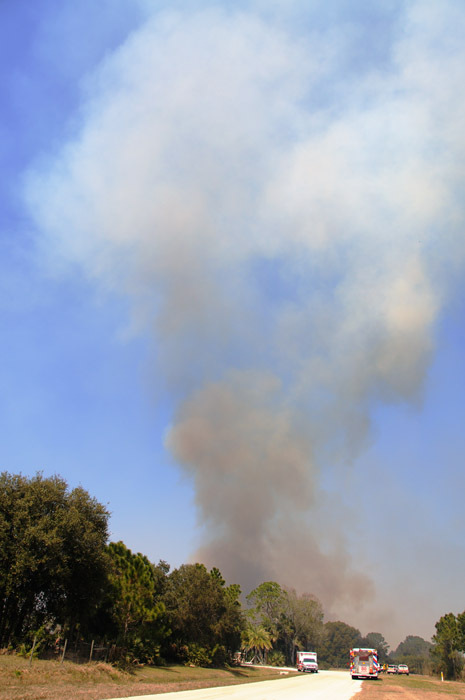 I somewhat covered, on this blog, the historic wildfires of 2008 in Brevard County. The outbreak destroyed three dozen homes. Above, firefighters stood in front of a blaze in Viera and stopped it from burning homes only feet behind them. 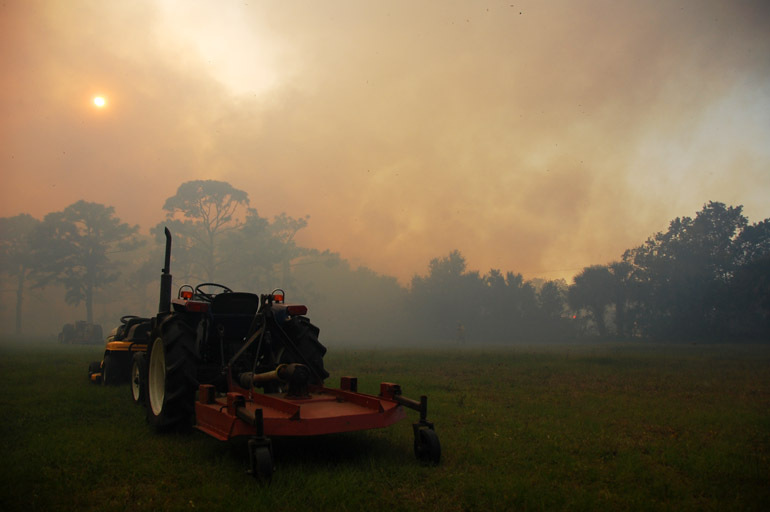 The 2010 wildfire season has commenced in Central Florida, and this grass blaze near Lake Washington Road in Melbourne started one morning two weeks ago when I was out for coffee. The gaper I am, I went to the scene and sipped my 7-Eleven joe while waiting for something drastic to happen. Disappointingly, the most exciting thing to happen was when a bedraggled fellow rubbernecker with long, oily hair and torn jeans spilled his bicycle in front of the fire-rescue crews. Apparently, talking on his cell phone and pedaling, all while watching the smoke plume, took more concentration than he could muster. He was unhurt. After nearly three years of rubbernecking by day - then posting the results of those adventures on The Offlede - and editing newspaper stories by night, I'm making a change. I've decided to employ my photographic and reporting skills toward more financially gainful ends than just a blog with a loyal but limited following. As of April 5, I will switch from copy editing - one of the most noble, thankless jobs in journalism - to reporting, a post in which I'll be responsible for reacting to breaking news and covering wide-ranging stories on multiple platforms: online, in print and possibly on television. 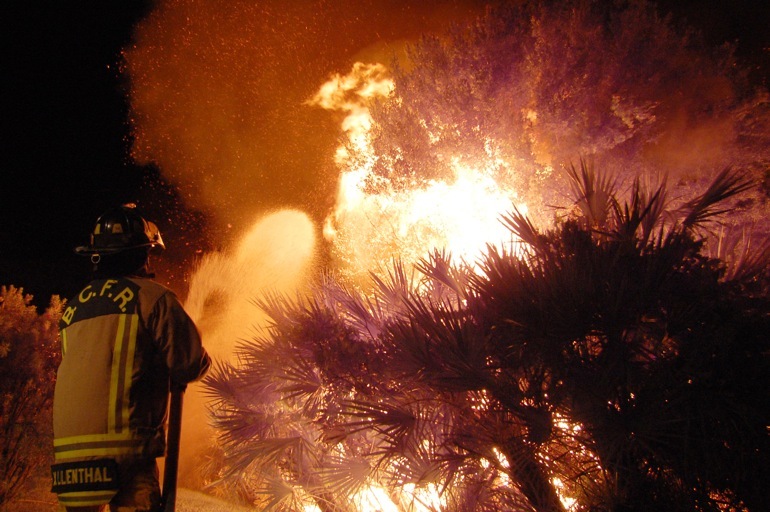 I'll be writing and shooting video and photos of man-induced incidents and natural disasters, including fires, which have so often attracted me in the past. (I do enjoy an adrenaline boost from time to time.) It'll be similar to my reportage in Bangor, Maine, but much different from the stories I wrote in Washington, D.C. There's no telling the nature of the impact on this blog. I do suspect that some things will be covered exclusively for my employer, but I'll alert readers here to any notable photos I take, of course. Coincidentally, The Offlede is at least partially responsible for this career development, as it has been unhidden from my bosses and a showcase of my work beyond the copy desk. It also kept my other skills and interests sharp while I practiced full-time editing. On The Offlede, more than a year has gone by since I last addressed any element of journalism. Some of the photos I take could qualify as journalism, but I haven't been directly discussing the state of the industry. The reason is simple: Journalism is not something journalists want to talk about these days. Newspapers, my medium of choice, have incessantly cut employees and forced them to take unpaid leave. With fewer co-workers, our jobs have gotten more difficult, but we have continued to step up to the plate and make the most of the situation. All of this we have done without rewards, as pay has been reduced and frozen. But, or so it appears, we're in for a bit of a thaw. No journalist wants to jinx his own profession, but I don't subscribe to superstition. With some promising indicators - increasing circulation and heightened advertising business - the industry is a much more palatable topic around the dinner table these days. Few people think journalism eventually will die. And I'm definitely not one of them. But in the future, unfortunately, reporting likely will become more valuable than editing. To be a journalist who can execute both tasks raises my stock, making it less likely that an employer would unload me. That's why I thought a change was in order. I'll miss copy editing. I'll miss the responsibility to ensure quality on Page 1, a job I've had for most of my time at FLORIDA TODAY. I'll miss catching errors that could have led to lawsuits and other embarrassing situations for my employer. I'll miss cracking jokes that only other copy editors understand (I won't even attempt one here). I'll miss writing the newspaper words that people always read: the headlines. I won't miss working weekends. 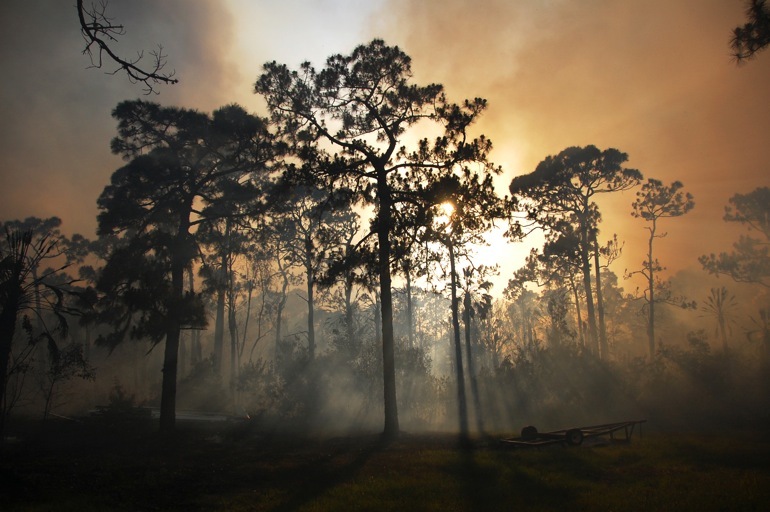 Taken off the hard-hit Corey Road in Malabar in 2008, this photo of smoke-diffused sunlight derived some beauty from such an ugly situation. Near where the previous photo was shot, this tractor sat in the front lawn of a home that was threatened briefly by the blaze. 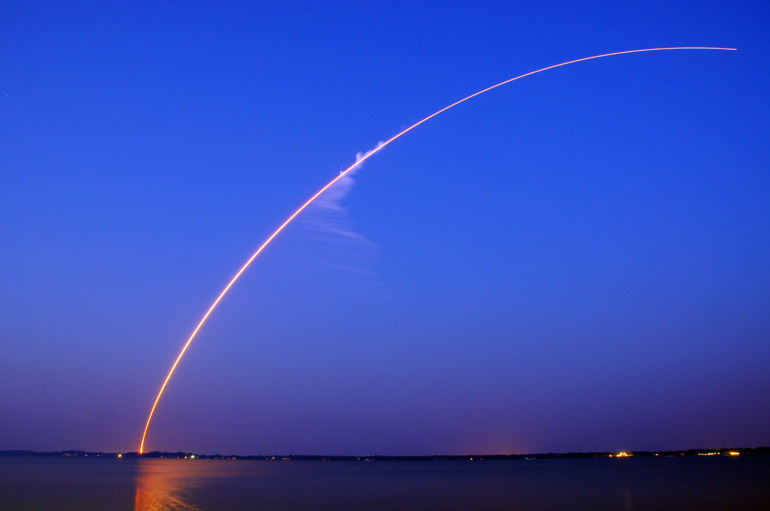 Purchase a print | With traces of sunlight still bouncing off particles in the atmosphere, a sky-blue color lingered for the duration of this 3-minute, 40-second exposure of a Delta IV rocket launch Thursday. 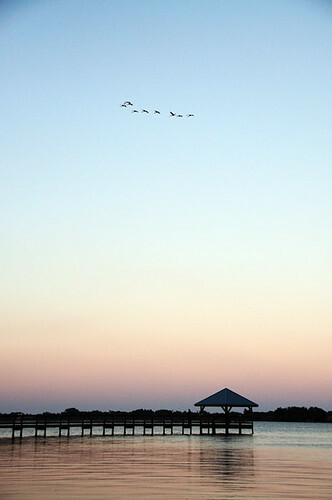 Liftoff was at 6:57 p.m., with sunset at 6:25 at this location along the Indian River in Palm Shores. There was also wildfire smoke drifting over the water. More about the exposure: the aperture was closed to its smallest, f/22, and the ISO was on its lowest, 100. Posting on The Offlede has been sparse recently, mostly because I've been tending to the aspects of my life that I've neglected in the past year. The utmost of these, in no particular order, are books, family and country music. Another, baseball, will lead to a few posts in the coming weeks, as spring training is now in full swing. Unfortunately, my Harley-Davidson will continue to get the cold shoulder if this frigid weather persists. This post, though, has a theme: streaks of heavenly - or soon to be heavenly - light. First, let's start with the last event of the week: the launch of a Delta IV rocket carrying a weather satellite to be used by the National Oceanic and Atmospheric Administration. TV news and National Weather Service meteorologists will employ images from this GOES-P (which has induced many urinary snickers in the newsroom over the past week) satellite in devising forecasts. Flying in the medium configuration with two solid rocket boosters - which provide more flame, exhaust and ascent force than a bare rocket - the vehicle was expected at 6:17 p.m. Thursday to make an arc of contrail that would be lit up by the setting sun. 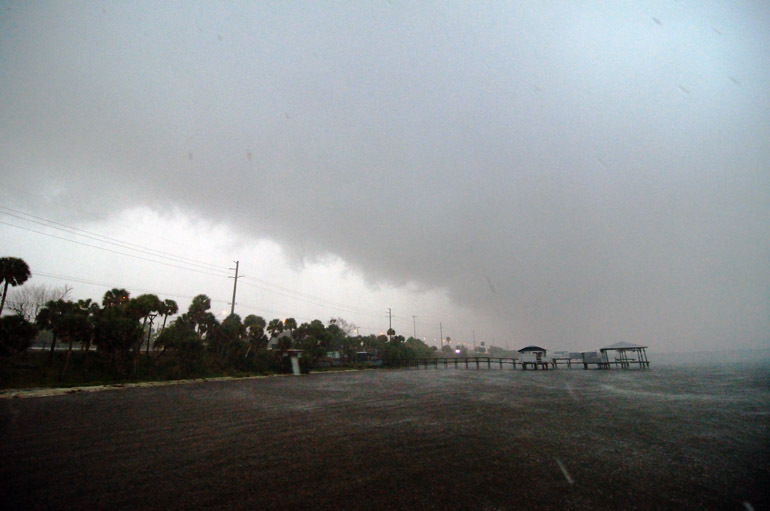 But a strong wind pushed back that attempt to 6:57 p.m., with dusk befalling the Space Coast. I determined that it was dark enough to attempt a long exposure of the rocket's flame arcing over the Indian River, near my workplace. Adding a splash of uniqueness to this launch was the smoke from a wildfire in Palm Bay, about 20 minutes to the south. It hung in the air like a light fog or a thick smog on a hot day. Conditions were otherwise clear and cold, like they have been for most of this odd Florida winter. For some reason, the sunlight reflecting off the International Space Station shined more brilliantly at the very beginning of the flyover. Typically, the station's glow grows in intensity as it gets higher in the sky (in this case Monday, its apex was 54 degrees in relation to the horizon). 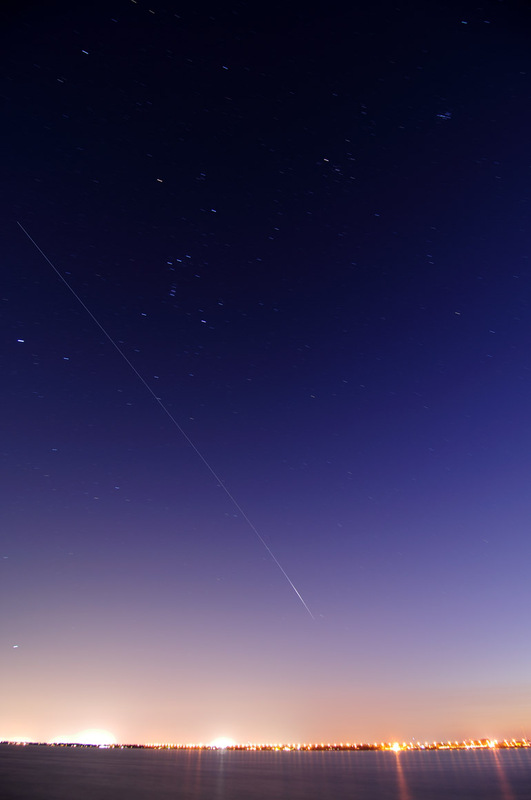 In the other streak this week, the International Space Station cut through the sky Monday evening, taking about four minutes to cross from the southwestern sky to the northeastern horizon. The exposure I made of the flyover is the longest I've yet to attempt: 2 minutes, 20 seconds, more than half of the station's appearance. Unlike a rocket and shuttle engine, the reflecting sunlight off the space station is dim - more like a bright, slow-moving star. Such a faint point of light requires a wide aperture so that the camera takes in enough light to register on its sensor. Got it? My fear while the shutter was open so long at f/4 was that the image would come out overexposed, especially from the ambient light along the Indian River in Palm Shores. That didn't happen. But the result was the light from the dusky sky overpowering the streak from the space station. That's why it's rather difficult to see in this image, which is rather unremarkable.